Under the roots of a fallen tree, Nature has already provided a quick shelter spot. whose feathers are these and what happened? Who says hard work can't be fun? When we arrived at Fairhaven Park Tuesday morning, most of the snow had melted with the exception of a snowman or two and some giant balls of snow in the big field. 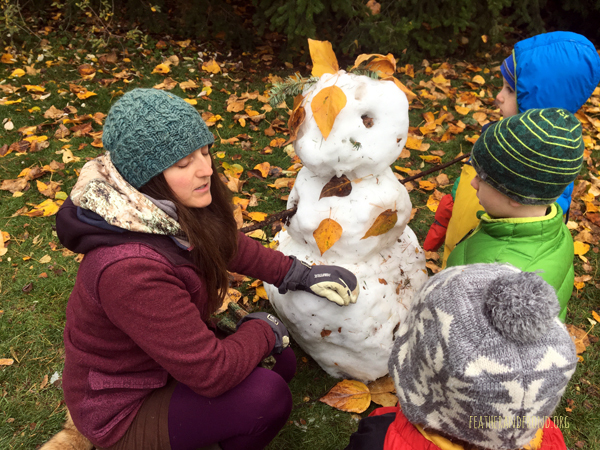 As we were examining the snowman, this inspired Melissa to make up a game of “Snowman Spy”. A variation of “Raven Spy”, everyone playing needs to tag to snowman & Melissa, whisper you name and hide before the snowman counts to zero… This happens overtime and the count keeps getting shorter so the game gets more fun and high paced as it goes along! The kids are really starting to get the hang of playing hiding games in the forest — some of them really disappear in the bushes! Our theme this week was shelter building, and in our continuing story Moon Bird and Running Deer need to make a primitive shelter to sleep in while they’re out on their adventure to Thunder Mountain. They build a lean-to shelter but encounter a common problem with primitive shelters, it doesn’t quite keep them warm or dry the first night… They wake up cold and wet to a douglas squirrel laughing at them. While initially offending by the rudeness of the rodent, Douglina the Squirrel ends up teaching them quite a bit about shelter building. She explains that they should pay attention to the “Five W’s of Shelter Building” : Wood, Weather, Widowmakers, Wigglies, and Water and even invites them to climb to the top of a cedar tree and take a look at her drey, or squirrel nest. Take a look in the trees at any park these days and you will likely find multiple dreys this time of year. The drey is constructed with sticks and debris - a lot of debris! That is how squirrel stays warm and Douglina the Chickaree explained that this would work for Moon Bird and Running Deer and a human shelter as well. 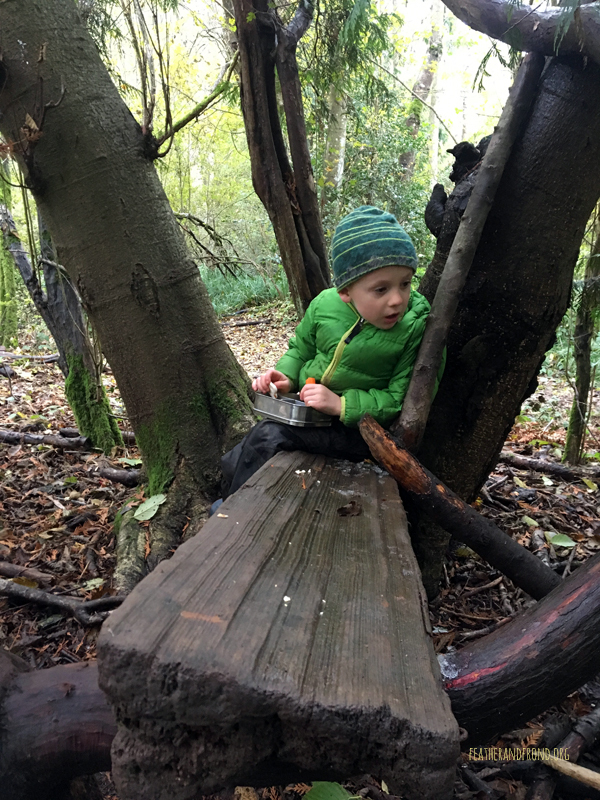 Armed with this new info, our friends decided to move their shelter out of the mud and away from the young alder trees and under a large protective cedar. They stack so much debris that both the floor and the roof have a heap as thick as a squirrels tail… and they finally have a nice warm and dry night of sleep! Thanks, Squirrel! 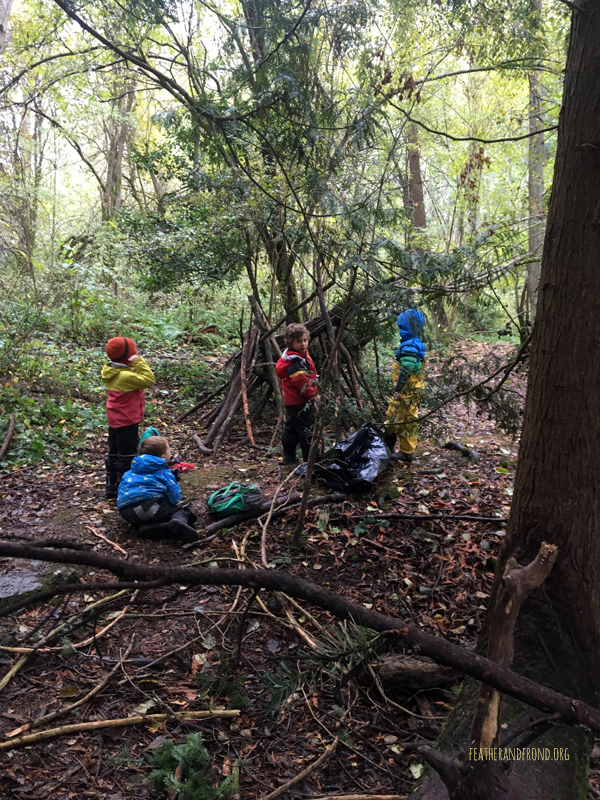 After story, the Fox Walkers shape-shifted into squirrels searched for the ideal place to build our own shelter. We talked about the 5 W’s and found quite a few places that were not OK. Either they had young tall trees all around or were in mud or wide open, etc…. Eventually we settled on a great spot under a big Cedar tree at “Forest Home” which already feels like a home base. We put some good time in working on a lean-to shelter for this week and have a real appreciation for how much work it takes to build an effective shelter! Having build shelters to sleep in the rain before, Melissa and I understand fully that the work is never done! You can always add more debris! This will be something that we will work on more in the future and possible rebuild in different ways since we have a lot of material there. Another great week down, excited for what lies ahead of us this week!